The Tile Doctor revamps their previous website to offer its clients a superior experience for a laptop, desktop computer, tablet, or smartphone. 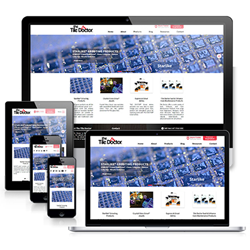 The Tile Doctor, the leading provider of innovative tile and grout products in North America, is excited to unveil its new, mobile-friendly website. The company decided to revamp their previous website to offer its clients a superior experience—no matter if they are using a laptop, desktop computer, tablet, or smartphone. Founded in 2000, The Tile Doctor offers a broad selection of specialty epoxy grout, care and maintenance products, and a full line of environmentally sound cleaners and sealers. They are the exclusive U.S. distributor for Litokol, the world's premier tile setting and grouting products. The new website offers detailed information about their products and several easy-to-use resources, including "How To" tutorials, blog posts, a store finder, a grout calculator, and much more. Additionally, the website invites users to "find inspiration" with a gallery of dazzling indoor and outdoor tile designs. Although The Tile Doctor's previous website had been online for many years and hundreds of people visited it each day, the company wanted to improve their users' experience and provide more valuable content by creating a new, responsive website that has a better design, better navigation, better pictures, and an overall better presentation so that they can keep people on their website longer and help them make a purchase decision. Curt Rapp, owner and founder of The Tile Doctor, sees the new website as an integral part of his company's strategy to further their expansion in North America, as the website uses SEO technology, which means that the webpage is designed to help users find The Tile Doctor on search engines. "This is an exciting moment for all of us at The Tile Doctor. The main goal of our new website is to create the ultimate customer experience, and I am confident that we have achieved that and more. The site's new design really captures the essence of our brand by blending seamless navigation with fascinating and relevant content that will inspire our clients with our visionary products," said Rapp. The Tile Doctor has become the go-to supplier for designer grout and tile products in the United States for architects, designers, contractors, and other people and organizations who are looking to bring their artistic visions to life. Some of The Tile Doctor's most sought-after products include Starlike Metallic Grout and Crystal Glass Grout, which is a translucent grout that is made up of tiny glass beads that reflect light. Crystal Glass Grout can be used on virtually any indoor and outdoor surface, including pools, hot tubs, steam areas, kitchens, bathrooms, and floor and wall tiles. Additionally, The Tile Doctor offers the single most revolutionary grout product available on the market in years, Crystal Glass Grout Jewels, which comes in 26 tantalizing colors that can be used to adorn glass tiles. The Tile Doctor also has a wide range of care and maintenance products, including High-Gloss, Semi-Gloss, and Hybrid sealers, which are UV-resistant and can be used on interior and exterior natural stone, marble, granite, limestone, brick, slate, unglazed tile, grout, and masonry surfaces. If you are an architect, designer, contractor, or are just looking for unique designer tile and grout products for your project, The Tile Doctor can help. For more information, visit http://www.tiledoctor.com or call 1-877-TileDoc (845-3362).